Hello and welcome back to the links of the week. 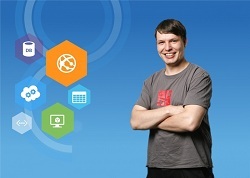 This week was another one with exciting announcements for Windows Azure, especially for the preview portal. Announcing: Improvements to the Windows Azure Portal – Announcement from Scott Guthrie about the enhancements to the Windows Azure Management Portal. Real-Time Chart using HTML5 Push Notification (SSE) and ASP.NET Web API – An example created by Brij Mohan Dammani how real-time updates can be done using the native HTML5 push notifcation. Upgrading an MVC4 Visual Studio 2010 Solution to Visual Studio 2012 and .NET 4.5 and EF 5 – Kevin Labranche shows how you can upgrade an existing MVC4 solution built with VS 2010 to a VS 2012 solution. This entry was posted in English, Links of the week and tagged Links of the week on October 14, 2012 by Jan Hentschel.